A ONE WEEK TRIAL SAMPLE WORTH £5! We are well aware of the distress scalp problems can cause and are dedicated to providing reliable solutions. Our Profol range has been continually monitored and improved since 1967 to become the outstanding treatments they are today. 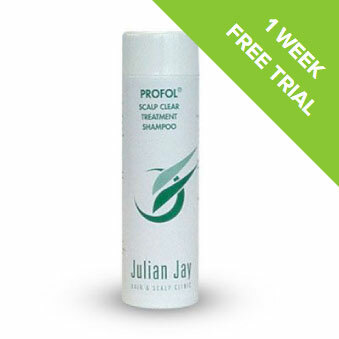 Our Profol Scalp Clear Scalp Irritation Shampoo has proved to be so popular that many delighted Profol users write to thank us for the remarkable results they have achieved. Gentle enough to use every day, the careful formulation ensures that it will not strip away essential oils or damage delicate new skin, while helping to tackle irritating scalp problems such as sore itchy scalp, Dandruff and dry flaky scalp. All you pay is 2.99 post pack and insurance and well send out your package straight away. Why wait ! Act today. You have nothing to lose and everything to gain.